Grand Theft Auto: San Andreas contains a lot of features which are required in order to complete the game at 100%. 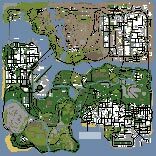 One of these features is similar to that of Vice City and GTA3 in needing to complete hidden challenges at various places found across the map. There are a number of challenges which need to be completed and you can read more about them below. The map which is accessible by clicking on the thumbnail below will show exact locations of each hidden challenge. The BMX Challenge can be found in the skate / bike park in Glen Park. If you look on your map for the actual park in Glen Park, then go down onto the next piece of grass, you'll be in the park. Once inside, get on the BMX at the top of the hill next to the half pipe to start the challenge. Your mission is to pedal around the park collecting checkpoints. Every checkpoint you grab will add 10 seconds to your time, however your time will be counting down as you go, so you need to be quick in grabbing them. This missions really does require almost maximum Cycling Skill however, due to the fact you'll need to bunny hop pretty high to grab some of the checkpoints. If you don't have much Cycling Skill, I strongly suggest you pedal around Los Santos on a bike until it starts to raise. Once it's high enough, jump on the BMX in the skate park and begin the challenge. - The stone half pipe in the bowl. - A high checkpoint South of the lower wooden half pipe. - The lower wooden half pipe checkpoint (hardest). - Higher wooden half pipe checkpoint. Now the two higher wooden checkpoint ones are relatively easy, you just need to get on the half pipe and mash X so that you start to climb the wood. When you reach the top you should almost definitely leave the ground and you'll grab the checkpoint, then go and do the same on the other side. Next you'll head to the stone half pipe. The best way to do this is to speed up one side of the half pipe, then hit L1 to bunny hop while going up. This will generally push you backwards, and if you did it right, you'll fly through the checkpoint. Next up is the higher one near the lower half pipe. All you need to do is stand right under it, and mash L1. I don't know how many people worked this out, but I discovered it on my first day of playing the game, mashing L1 will sooner or later result in a "Super Bunny Hop". You'll go two or three times higher than normal and it's easily high enough to grab this checkpoint. What's more, it doesn't even require max cycling skill, you can just keep mashing L1 and eventually (if you have enough time) you'll jump high enough. The final checkpoint is by far the hardest, so lets hope you have a lot of extra time to grab it. Get into the half pipe, then speed up the ramp to the East and try to force yourself up onto the ledge. The only way this is possible is if you just keep going back and forth up and down both sides of the half pipe, then lean forward in the air to try and push yourself onto the ledge. You'll really need a bit of luck, but once you get the hang of it and get up, it's mission complete! There is a glitch which my good friend Platinum found which allows you to have no time limit on this mission. All it requires you to do is grab a checkpoint literally JUST after the timer disappears after hitting 0 seconds. The best way to do this is to go down the hill to the right and wait under the floating checkpoint, in a bunny hop position. About half a second through 0 seconds, release L1 and if you timed it perfectly, you'll get the checkpoint just after the timer disappears, and then you have as long as you want to grab the rest! If you miss the exact time, just pedal to the top of the hill and get off, then back on the bike to start the mission again. It takes a bit of good timing, but it certainly helps if you're having trouble with the mission. You can replay this mission any time in order to better your time in the stats. The NRG-500 challenge takes place in the abandoned Dry Dock at Easter Basin, which is just next to the large Import / Export ship. Like the BMX challenge, you'll need to grab a number of checkpoints dotted around the area, however this time it's on a motorbike which means more speed, however you don't have the ability to bunny hop, so you need to position your jumps perfectly. The bowl is rather steep, and you'll need to successfully jump out of it about 15 times in order to grab the checkpoints floating above it. Unfortunately, this challenge is a lot harder than the BMX challenge, and there isn't any specific route you can take. The best advice I can give is to head around the top first, collecting the checkpoints at ground level, then get all of the checkpoints at the bottom of the dock. From there it's just really luck as to whether you hit the jumps at the right angle and manage to fly high enough to grab the rather frustratingly placed floating checkpoints. Going up the steep ramp slightly sideways and jumping alongside it, rather than up it seems to be the best way to go about getting the checkpoints, but even with full bike skill, it's extremely hard to work out while angle to approach at, when to lean back and forward, and even how much speed to carry. My best, and frankly only advice is to just keep trying the jumps until you get them right. Collecting the top and bottom checkpoints should give you about 1 minute to get the last 7 or 8, so that's about one every 10 seconds or so, which is usually 2 or sometimes 3 jump attempts. The glitch from the BMX challenge where there is no timer works here too, however it's a lot harder to get working. Your best bet is to wait on the top just above the 2 checkpoints on the ramp. As the time reaches about 1 second, drive over the edge and land on the checkpoint. Perfect timing will result in infinite time, although it is extremely hard to get it right. Each city has a hidden Courier Mission which is very similar to the Pizza Delivery missions from Vice City. These are sort of hidden, however they are not too hard to find with this guide. In Los Santos you'll need to locate Roboi's Food Mart and get on the BMX. When you get on the bike you'll start the challenge and will have to speed around the map to various locations where you'll find a large floating corona. You will then need to throw a package into the corona. You do this by holding L1 or R2 to drive by, then hitting L1 or Circle. If the package goes through the corona, move onto the next one. If you miss you can drive over it to pick it back up. You will need to get through 4 levels of deliveries before your time runs out. In Los Santos, the courier challenge can be found outside Roboi's Food Mart. This is located in Commerce which is to the South West of the Los Santos area. Look for a winding road going through a yellow-ish grassy area on the Radar. Above this to the North is a small square on the radar. The entrance to the mart is just to the North side of this square. Upon getting on the BMX you'll start the mission. You now have 6 items and must deliver to 3 of the coronas. Drive to those locations marked with a yellow blip on the radar and drive-by them to drop the package. Once they're all done, try to keep your remaining items as you'll be rewarded for them. Head back to Roboi's Food Mart where you'll start the next level and pick up more items. This time you need to deliver 4. Continue doing this and work your way through the levels. On the final level you'll need to deliver 6 items, however they are literally all over Los Santos, from one end to the other, so you need to pedal pretty fast to get there and back in time. Roboi's Food Mart has been Acquired as an Asset. Each city has a hidden Courier Mission which is very similar to the Pizza Delivery missions from Vice City. These are sort of hidden, however they are not too hard to find with this guide. In San Fierro you'll need to locate Hippy Shopper and get on the Freeway. When you get on the bike you'll start the challenge and will have to speed around the map to various locations where you'll find a large floating corona. You will then need to throw a package into the corona. You do this by holding L1 or R2 to drive by, then hitting L1 or Circle. If the package goes through the corona, move onto the next one. If you miss you can drive over it to pick it back up. You will need to get through 4 levels of deliveries before your time runs out. In San Fierro, the courier challenge can be found outside Hippy Shopper. This is located in Queens which is to the Central West of the San Fierro area. Look for a winding road going down to the West towards a square of buildings on the Radar. Just south of this is a slightly weird shaped rectangle on the radar. The bike can be found at the North West side of this rectangle. Upon getting on the Freeway you'll start the mission. You now have 6 items and must deliver to 3 of the coronas. Drive to those locations marked with a yellow blip on the radar and drive-by them to drop the package. Once they're all done, try to keep your remaining items as you'll be rewarded for them. Head back to Hippy Shopper where you'll start the next level and pick up more items. This time you need to deliver 4. Continue doing this and work your way through the levels. On the final level you'll need to deliver 6 items, however they are literally all over San Fierro, from one end to the other, so you need to go pretty fast to get there and back in time. Be aware that unlike the BMX, crashing the bike will result in damage, and you need to keep the bike in one piece in order to finish the mission. Hippy Shopper has been Acquired as an Asset. Each city has a hidden Courier Mission which is very similar to the Pizza Delivery missions from Vice City. These are sort of hidden, however they are not too hard to find with this guide. In Las Venturas you'll need to locate the central Burger Shot and get on the Faggio parked around one side of it. When you get on the bike you'll start the challenge and will have to speed around the map to various locations where you'll find a large floating corona. You will then need to throw a package into the corona. You do this by holding L1 or R2 to drive by, then hitting L1 or Circle. If the package goes through the corona, move onto the next one. If you miss you can drive over it to pick it back up. You will need to get through 4 levels of deliveries before your time runs out. In Las Venturas, the courier challenge can be found outside the Central Burger Shot. This is located in Redsands East which is to the dead in the center of the Las Venturas area. Make your way to the Burger Icon on the radar in the center of Las Venturas. Once you get there, go around the building until you find a parked Faggio. Upon getting on the Faggio you'll start the mission. You now have 6 items and must deliver to 3 of the coronas. Drive to those locations marked with a yellow blip on the radar and drive-by them to drop the package. Once they're all done, try to keep your remaining items as you'll be rewarded for them. Head back to Burger Shot where you'll start the next level and pick up more items. This time you need to deliver 4. Continue doing this and work your way through the levels. On the final level you'll need to deliver 6 items, however they are literally all over Las Venturas, from one end to the other, so you need to go pretty fast to get there and back in time. Again, remember the bike will take damage, so drive carefully as to not blow it up. Burger Shot has been Acquired as an Asset. Parked on the top of Mount Chiliad you will find a Mountain Bike. Getting on this bike between the times of 07:00 and 18:00 will start The Chiliad Challenge. This is a race to the bottom of the mountain against a number of other competitors. There are three different routes which can be taken, and each additional race will be unlocked after completion of the previous. The first route is the simplest and is called the "Scotch Bonnet" route. This route is relatively easy, it's just back and forth along the downhill roads all of the way to the bottom. Use the handbrake on the corners and try to not hit the fences as they'll slow you down or even spin you around. You can actually cut quite a lot of the corners and still grab the checkpoints, so try to work out how much you can actually cut and use that to gain places. Mash the X button when you're going straight to get max speed, and always use a combination of the hand brake and brake to slow down when you think there might be a sharp corner. As you get towards the bottom of the mountain make sure you do not go off the side, or you'll almost definitely finish in the last 3. If you want to win, you need to finish the race without crashing or falling off the mountain. If you don't win you'll need to grab a vehicle and drive back up the mountain because you're starting again. Parked on the top of Mount Chiliad you will find a Mountain Bike. Getting on this bike between the times of 07:00 and 18:00 will start The Chiliad Challenge. This is a race to the bottom of the mountain against a number of other competitors. There are three different routes which can be taken, and each additional race will be unlocked after completion of the previous. The second route is slightly more difficult and is called the "Birdseye Winder" route. The route starts the same as the previous one, however it goes off to the right after a few corners. From here it's back and forth down some winding roads which may be unfamiliar with many riders considering it's a strange route which probably isn't taken very often while heading up the mountain. You'll follow it around and through some trees before finally getting to the bottom road of the mountain which continues from the first race. You'll need to make the sharp right corner then speed down the slope to the finish. Remember that you can almost always catch up to the riders with 10 or 15 seconds of good riding. I crashed about half way and was sure I'd lost, but I kept going and over took the leader on the final straight to win the challenge. Parked on the top of Mount Chiliad you will find a Mountain Bike. Getting on this bike between the times of 07:00 and 18:00 will start The Chiliad Challenge. This is a race to the bottom of the mountain against a number of other competitors. There are three different routes which can be taken, and each additional race will be unlocked after completion of the previous. The final route is by far the fastest and most dangerous and is called the "Cobra Run". The Cobra Run is extremely difficult, however the AI is pretty stupid too, so you can expect them to crash into almost every tree. All you need to do is hold X to keep a decent speed and follow the track through the checkpoints, then once you're off the wooden ramps, just speed down the dirt path towards the final straight, and then onto the finish. You can jump over the hills on the middle section and gain a lot of time as you can grab three checkpoints in 1 jump rather than spend 15 seconds weaving down the track to get them. All Chiliad Challenges completed. You can play through them again at the top of the mountain. Design, layout and all images are Copyright of Vendetta, Psy and GTA-SanAndreas.com.